Why You Should Consider Freelancing | The Daily Programmer '+g+"
Most people associate freelancing with freedom. You have complete freedom over your work, you are your own manager. You have the freedom to set your work time, your work place, your work conditions. Instead of your life revolving around your office hours, you can have your work adjust to your social life. Or, you can mix work and life to whatever extent you want to! If you still need some convincing, this article is for you. Here are 5 reasons, apart from the freedom speech mentioned above, why you should consider freelance. 1. You have a lot of time on your hands. So why not turn it into some cash? With freelancing, you can make good use of the time you would have otherwise used to binge watch that favourite show of yours. Freelancing will not only help you feel productive, it will also open a whole world of opportunities. 2. There is not a great market for the unique skills you possess. Remember, Internet is a strange place. So, if there is something only you can do, and you are really proud of it, however silly it is, go sell it! Believe me, there's a huge marketplace out there (and yes, it is getting pretty saturated, so you need to hurry up). Search for the stupidest gigs on fiverr, or watch some silly youtube videos, and get inspired. 3. You need some extra cash. There's always a time in one's life, well you know what time I am talking about. Maybe it's one of those rainy days your mother always told you about, but you barely listened. Freelancing is a better choice than some of the options people seek out in their financial desperation. 4. You want to test the waters a bit. You are reading this article because you are still unsure. Freelancing has come a long way since "Oh! so you basically work for free". It has gained reputation, and successful freelancers are getting paid for it. In hefty amounts. 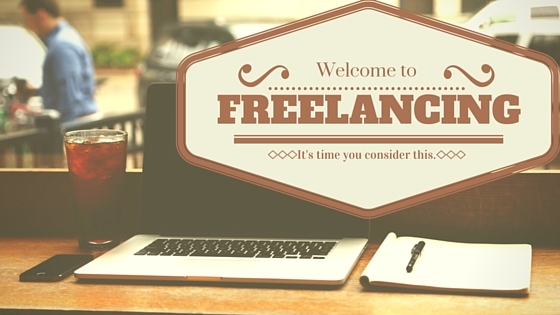 More and more people are becoming aware and acknowledging freelance careers. Best of all, it requires little to no investment, so you can try it out to see if this path suits you, without hurting anything. 5. You get to learn new things. You try new things, you learn from them. And from the inevitable mistakes too. But you are a whole lot more knowledgeable than before. So put on your freelance hats and tell us about your first steps in the comments section below, people love real stories!